Third week on my couch now blak. 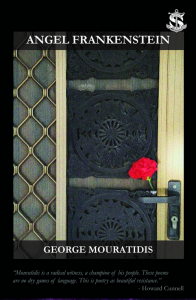 Alison Whittaker concentrates her second collection of poetry on the consequences and complexities of the unrecognised/unacceptable/unjust Indigenous labour that has been worked – and is still being worked – in this country. As such, it’s not redundant to emphasise that writing a book about such concepts requires an unquantifiable amount of labour. Within our colonial, capitalist and patriarchal society, the common question of: ‘so, what do you do?’ really means: ‘what do you do for work = money?’ And the type of answer to this question is habitually associated with preconceived assumptions based on race, class, education and socio-economic status/potentiality. Whittaker’s Blakwork works to expose, disrupt and denounce these modes of thinking. 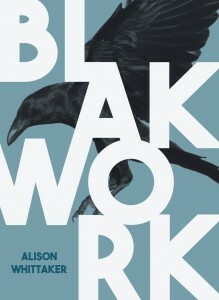 Blakwork is divided into fifteen sections; the majority entitled with a distinctive form of labour including: ‘bloodwork’, ‘heartwork’, ‘workwork’, ‘newwork’, and ‘blakwork’. The intentional absence of a space or hyphenation separating each specific form of work could be understood to enact pressure – demonstrating that these forms of labour have been enforced by colonisation rather than selected. The terms ‘work’ and ‘blakwork’ are necessarily repeated throughout the collection, because as Whittaker establishes, there is more than one form of ‘blakwork’. Whittaker’s poetic repetition also signals to white readers (such as myself) that the writing of this poetry is another form of ‘work’. Whittaker stunningly complicates the overall collection by including three sections which still address forms of labour, but are instead written in what may be read as prose: ‘the abattoir’, ‘the school’ and ‘the centre’. The unfinished words and fractured words in this poem disrupt the linearity of reading and reveal the problematic and distressing experience of working within ‘Fresh blakwork; industrial complexes’ and amongst the ‘white guilt’ explored at the beginning of the poem. Poems such as ‘housemade’, ‘rework’, ‘palimpsest’, and ‘a love like Dorothea’s’ are all symbolically printed in landscape on the page. The action of turning the book on its side to read these poems reflects the way bodies must move in specific ways when it comes to undertaking ‘work’ and again disrupts an expected linearity. Whittaker consistently calls for a revision of colonial understanding and this is especially significant within the poem ‘a love like Dorothea’s’, a revision of Dorothea Mackellar’s colonially canonised poem ‘My Country’. I never lived in a time to love a love like Dorothea’s. of our missing sunburnt country, on which our prone feet land. Yet onto which Mackellar’s gaze turns rivers into sand. of curling hair and ash. For those unfamiliar with the explicit meaning of ‘calenture’, Lindsay Tuggle provides a definition, and her relationship with this expression, in her collection’s preface. The definition reads that ‘calenture’ is: ‘A fever incident to sailors’ occupying tropical climates and is ‘characterised by delirium in which the patient fancies the sea to be green fields, and desires to leap into it’. Such a specific hallucination incites the subjectivities of loss. 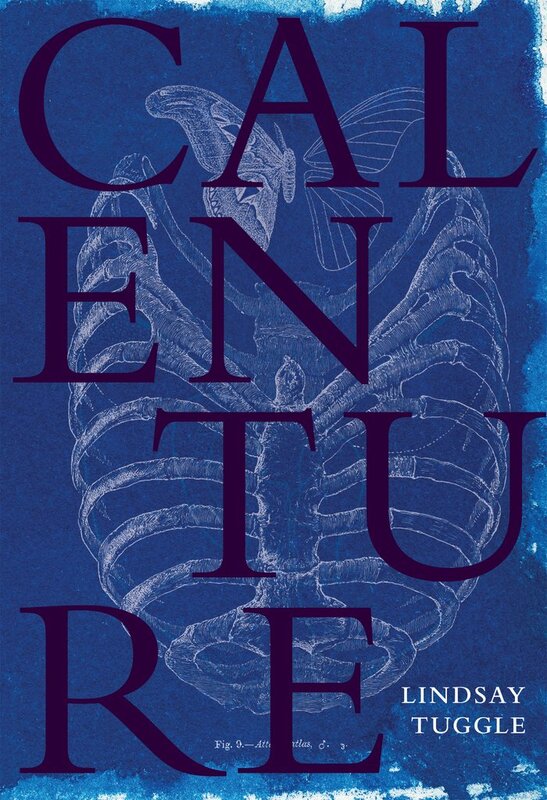 Calenture: a specific word for a specific state – which is paradoxical in the sense that much of Tuggle’s poetry circumnavigates the abstract and ineffable complexities relating to death, mourning and melancholia. Tuggle exposes and concentrates many of her poems on the political economies of death and mourning, with the elegy as a form of ‘transaction’ with loss = a form of artistic gain. Tuggle writes in subversion to this: ‘In order to emerge from a transaction / unharmed, simply withdraw the possession’. Simple…right? Because ‘the walls have been hollowed / for your convenience’, and it’s been said that: ‘The only party worth /attending is a funeral’. Tuggle’s collection is divided into two sections: the eponymously titled ‘Calenture’ and ‘An Elementary Treatise on Human Anatomy’, both demonstrating the abstract and the visceral elements of death. The ‘Calenture’ section focuses more on emotion and memory and the second sequence is a twelve-part poem written after Joseph Leidy, who Tuggle informs in the book’s ‘Notes’ was an ‘anatomist and naturalist’, who in 1861 published a book with the same title, which ‘exemplifies the fetish of certain nineteenth-century bibliophiles, who collected books bound in human skin’. Unnervingly, the ‘bibliophiles’ who exhibited such a fixation ‘were usually surgeons’, and the leather for their collections ‘originated from autopsied bodies of their patients’. Calenture is not: ‘Just another posthumous seduction’ and Tuggle’s poetics refuse to be ‘sentimental’. There are multiple forms of bodies focused on throughout Calenture, including the bodies of the deceased, grieving bodies, the bodies of books bound in human skin and Tuggle’s body of poetry. Calenture strikingly entwines these bodies and allows for the insight that: ‘We are all flesh / toying architecturally with bone’. And as Tuggle stresses: ‘Every elegy needs an author. And then, an autopsy’. The title of Michael Farrell’s recent collection I love Poetry is both declaration and provocation. While there’s a consistent parodic tone throughout the collection, the poems also demonstrate sincerity, allowing Farrell to reveal the similarities between these modes of expression and to problematise fixed notions of understanding. Farrell also situates his poetry within past/present colonial Australia, alongside pop culture references, to subvert the effects/affects of Australiana and nationalism. kinds of ideas, he murmured. Farrell’s Professor (and perhaps actual professors readers may have encountered?) trusts his authoritative position so completely that he feels qualified to gaze upon a student’s physicality (read: race and gender) and is able to judge their effectiveness not only in waste removal but their potentiality of academic prowess = desirability. 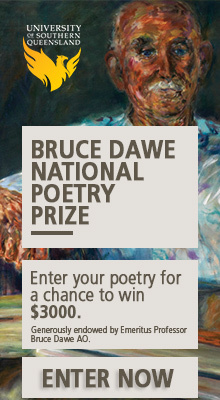 This collection challenges what we have/might/could think about the reading and writing of poetry. As Farrell stirringly writes: ‘It’s as if you’re writing for those who might not read / you rather than those who might’. types, or interred on a library shelf. ‘poem of the day’ calendar. 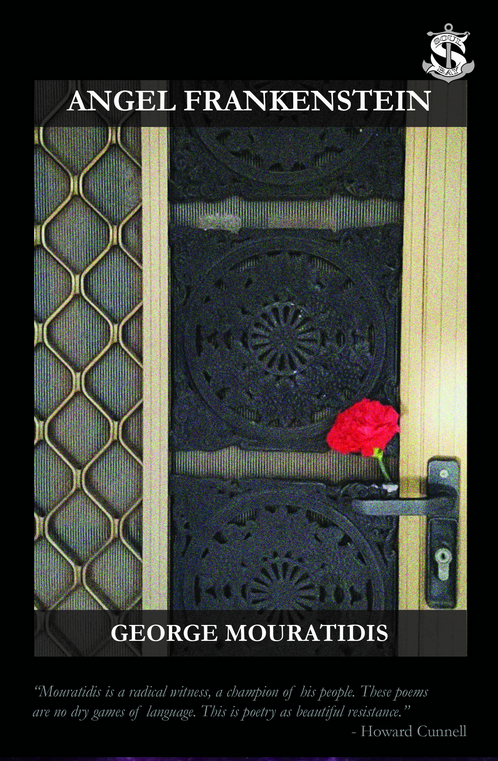 With the hope of not limiting this poem to an autobiographical reading, ‘That Poem’ may be interpreted as exploring how this country’s dominant colonial culture has impacted on Mouratidis’ formative years, and his interaction with the types of literary consumption that have historically been elevated over more marginalised voices/communities. 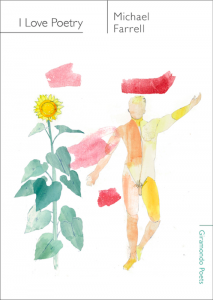 The poem expresses the extremities a person may experience when they’ve been exposed to a literary realm that has historically silenced/erased expressions of diversity – something which this collection intends to counteract. As Mouratidis writes in the poem ‘Corner of Main and High’: ‘the unceasing hammering of master myths whose / formaldehyde keeps leaking on your shoes … your living / never caught in those sample photographs that / come with the frames’. As the title of Angel Frankenstein suggests, Mouratidis’ poetry is also concerned with the construction of dichotomies, what’s between them and how language might break them down. This is evident in the reference to Mary Shelley’s character of Victor Frankenstein, the creator of ‘the monster’ which has had a long history of mistakenly being referred to as ‘Frankenstein’ (rather than ‘Frankenstein’s monster’). The inventor’s name has become synonymous with their creation, and this is Mouratidis’ point: that there is a commonality of mistranslation/misunderstanding – which isn’t actually incorrect at all, in a sense. It would not perform its ethnicity for you, μαλάκα. Εκείνο το ποίημα δε βολεύτηκε με λιγότερο ουρανό. It would not translate itself or keep its voice down. Angel Frankenstein emphasises that the past attaches to the present: ‘…the / entrails of our histories aren’t dissected by cadavers / but scab over’. 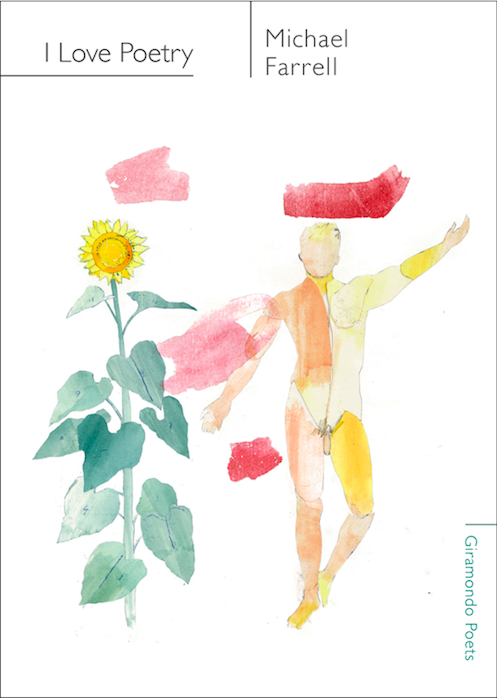 This concentration on the physical consequences of othering, specifically within this country, allows this collection to reveal that unlike a scar, a scab still has layers to connect and Mouratidis has chosen poetry to express the need for new imaginings to form. Autumn Royal is a poet and researcher. She is interviews editor for Cordite Poetry Review and author of the poetry collection She Woke and Rose.